3 Main Goddess Deities which names this temple Mahalakshmi are Shree (Mahasaraswati, Mahalakshmi and Mahakali). 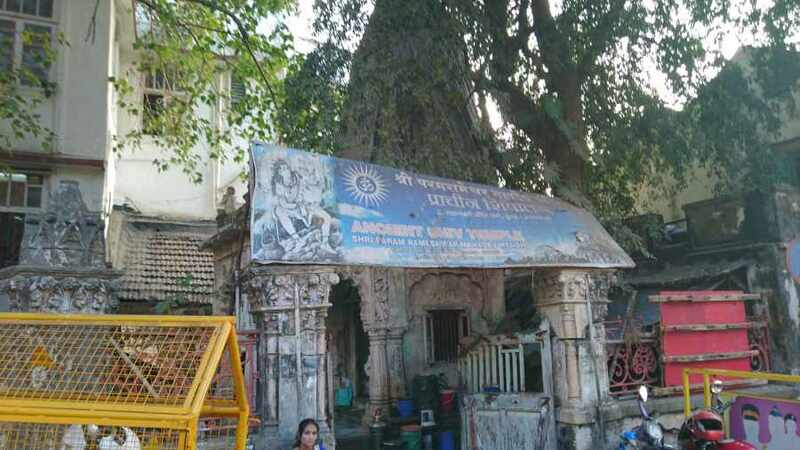 This temple is one of the oldest in Mumbai with design and structure as it is since decades. Quite narrow premise as surrounded by residents, The backside of temple is wide open rocky sea easy accessible. Visiting the sea front is safe, Just take care when walking on slippery rocks and ignore during monsoons. Multiple temples inside one premise is what i can say when talking about main attractions inside. It is a very simple ancient structure, and like any other temple in Mumbai. The main entrance on road side is exactly opposite the famous Cadbury Factory which has ‘Lord Ganesha’ temple following a entrance gate that goes to main temple. On this gate (See Photo) has year printed ‘1905’ with name ‘Prince Triumphalarch’ and a old clock below, Possibly when temple was developed. I really don’t know about ‘Prince Triumphalarch’ and thought just to moved ahead towards inside premise. As soon i enter this gate, On left side is sloppy location used as car parking with space limited to hardly 5 to 6 cars. (See more details about car parking at end of this article). 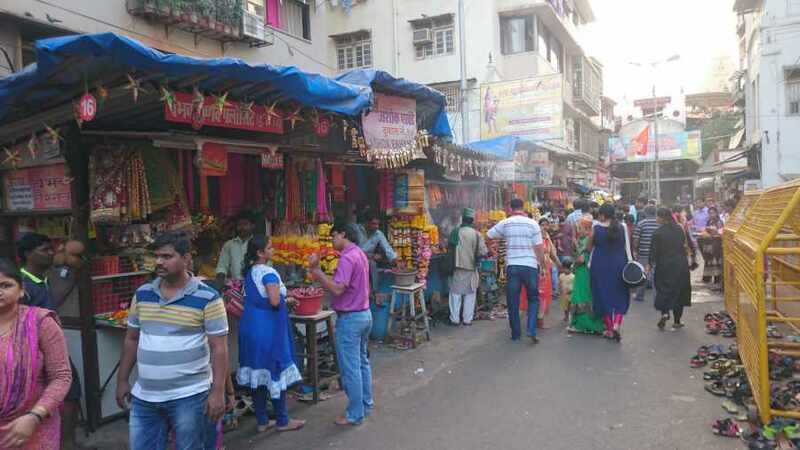 Walk ahead and a straight lane which is the main premise gets started with shops on both side, a divider for entrance and exit with shoes care vendors in centre. Major this lane has food vendors and other shops on both sides. 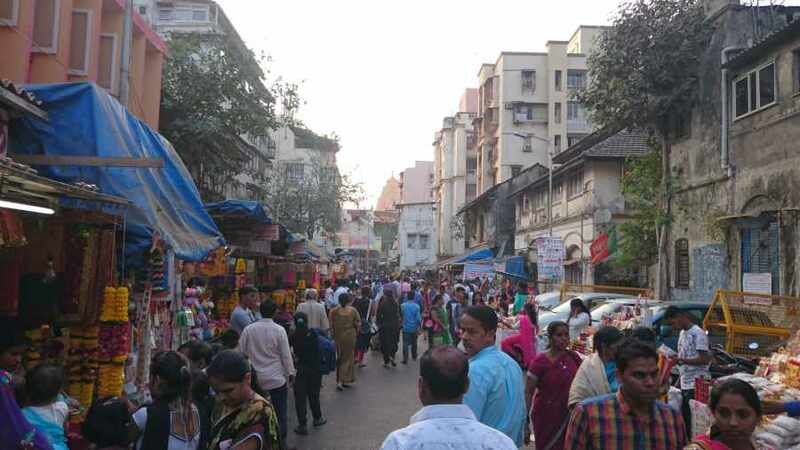 Its about 50 to 70 metre stretch, heavily crowded during Sundays and Hindu festival days. 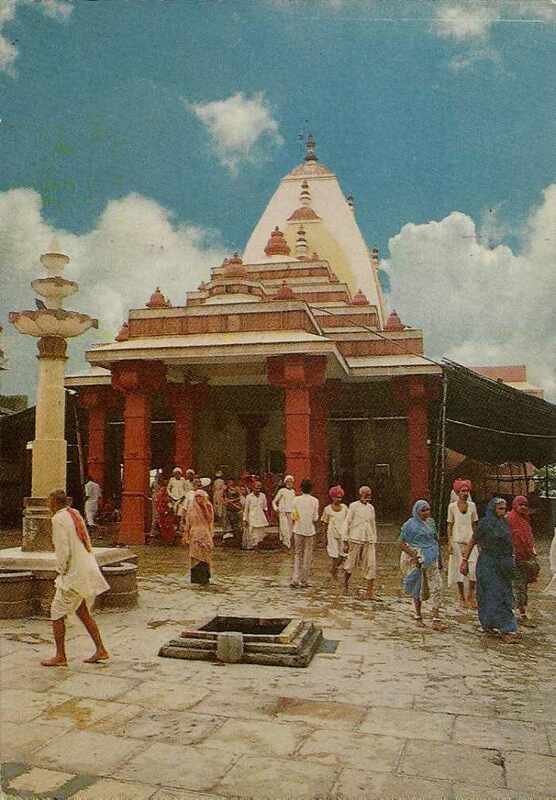 One small and ancient Shiva temple (Shree Param Rameshwar Mahadev Mandir) can be seen on left side as you enter. Sadly not well maintained, not coloured since decades and things kept all around it (See Picture). Walk little ahead and their is another huge temple on left side just before all flower vendor shops starts. Its a small lane with few ladders to climb and a surprising big temple of Hindu Gods, Bigger than the main temple itself. You must visit this temple to sit and relax a little as the premise inside is ample, serene with cool breeze of sea compared to main Mahalakshmi temple just adjacent. 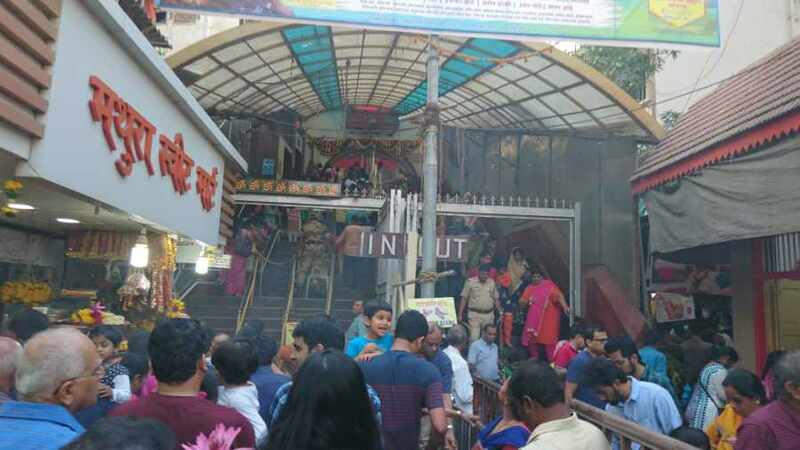 Walking ahead and devotees be seen purchasing Sweets and Flowers etc to offer inside main temple and the ladders to climb starts (Just 10 to 20 odd ladders) with a security check and metal detector gates before you reach the top of main Mahalakshmi Temple. You can safely remove and keep your shoes at the shoe keeper ladies near temple ladders who takes care of it charging just Rs.5. They will give you a plastic token with number written to keep it safe and secure from shoe thieves loitering in temple. Do take care of you bags, pockets and money when inside crowded premise. Once inside, Separate queue for Male and Female devotees can be seen and a little space exactly in middle to sit and relax for a while once Darshan is done. As said the backside location is wide open rocky sea if you looking further for some fresh sea air and fun around. Washroom for females and males are available adjacent inside main temple premise on top and Trust office is located adjacent to temple. You can hardly stand for 30 seconds inside for Goddess / Mata Darshan and are asked to move ahead. One more fun and surprise if never seen in any previous Hindu temples is at backside wall of Goddess idol. Here there are couple of black sticky looking stones laid on walls where you will be surprised to see people trying to stick coins by places them and holding them for few seconds. Many Devotees still have a myth that if one tries to stick a coin and it gets stuck on that black stone then their wishes get fulfilled, Silly. But guess what, The money collection business into the trust account is ready. Try once and if the coin slips and do not stick, It goes straight inside box and you will not be able to get second change to try your luck. Temple Open & Closing Timings : 6:00 Am to 10:00 Pm, Weekdays and Weekends both. Naivedya Timings : 12:00 Noon. Aarti Timings : 4 times in a day, Early Morning Main Aarti at 7:00 Am (20 Minutes), Evening Dhoop Aarti at 6:00 PM (10 Minutes), 7:30 Evening Main Aarti (20 Minutes) and Night Closing Shejarati Aarti at 10:00 Pm. Sundays are the most crowded compared to weekdays. So, If you are planning to visit both holy places i.e Mahalakshmi temple and Haji Ali Dargah together, I will recommend you to select another day, except Sunday as Haji Ali (Hardly 2 minutes walking distance) is very much crowded on Sundays and the path way to Dargah is very narrow. 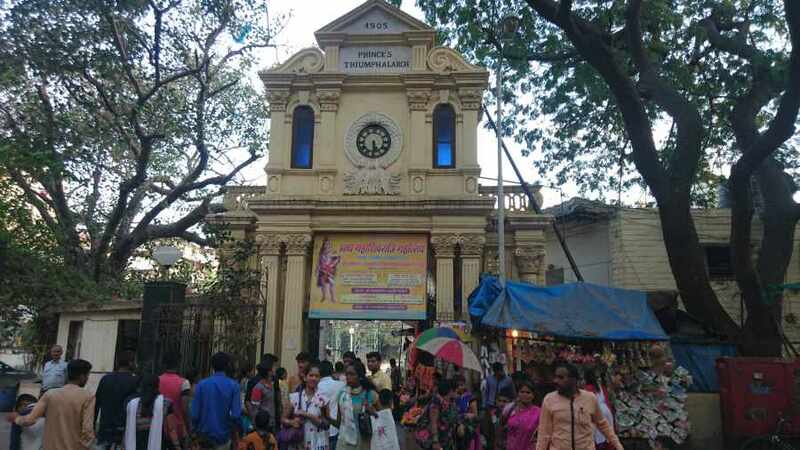 The temple operates under a trust called ‘Shree Mahalakshmi Temple Charities’ and it received good amount of Donations throughout the year for which they have also kept receiving options like Digital Money transfer (NEFT, RTGS, Credit Card Swipe machines) etc easy available. As detailed by temple authorities on their website, Money is then used for temple maintenance and other social activities like helping to various relief causes and poor citizens via Scholarships and Medical facilities. They also run weekly medical camp for free check-up (Homoeopathy, Ayurvedic and Allopathy) and have some more advance treatment plans. The money is also used as help and donations during various natural calamities like draught and also operates as Donations and Charities to various NGO’s operating in various fields to help needy people. Balance all invested at major Financial Investment Options like Mutual Funds etc. Temple Trust Name : ‘Shree Mahalakshmi Temple Charities’. Address : Bhulabhai Desai Road, Mumbai 400026. Contact : +91-22-23514732. Landmark, Near Cadbury Factory, Opposite Audi Showroom. Nearest Railway Station : Mahalaxmi or Mumbai Central, Both on Western Railway Route on West side of stations. Reaching Mahalakshmi Temple : By Rail, From station take cab which will take just 5 minutes. If reaching by road from North side of Mumbai via car, Take National Highway 8, Take Bandra Flyover, Go Straight and use Bandra Worli Sealink for fater journey. Take U-Turn as soon you exit from sealink and be on path way of Worli Sea face (Promenade). From Main road signal take RIGHT and you will Cross Nehru Centre soon be reaching Haji ali junction. Go straight and you find another signal, Take right towards Breach Candy Hospital road (See Parking Details Next). Car Parking : At Entry gate their is free car parking space available, But not more than 5 to 6 car can be parked at a time. People park on road side or use Central Mall adjacent to Haji Ali Junction (Recommended if you don’t get parking near temple). On Sundays, parking conditions are worse, While on weekdays you will get parking space at temple’s entry gate. IMPORTANT NOTE : To use the temple parking, Go straight from signal on breach candy road and take first U-Turn and back towards Mahalakshmi temple. You will see a Jain temple on left and Just few metres ahead after a bus top on left side is this parking lane. Photography Restrictions : Video Shooting and Photography via Mobile or any Camera is strictly prohibited inside the main temple premise on top. You can’t even take group selfies or family pictures. Although once you step down the temple ladders, you can take pictures of the shops inside premise till the main entrance (See Video).